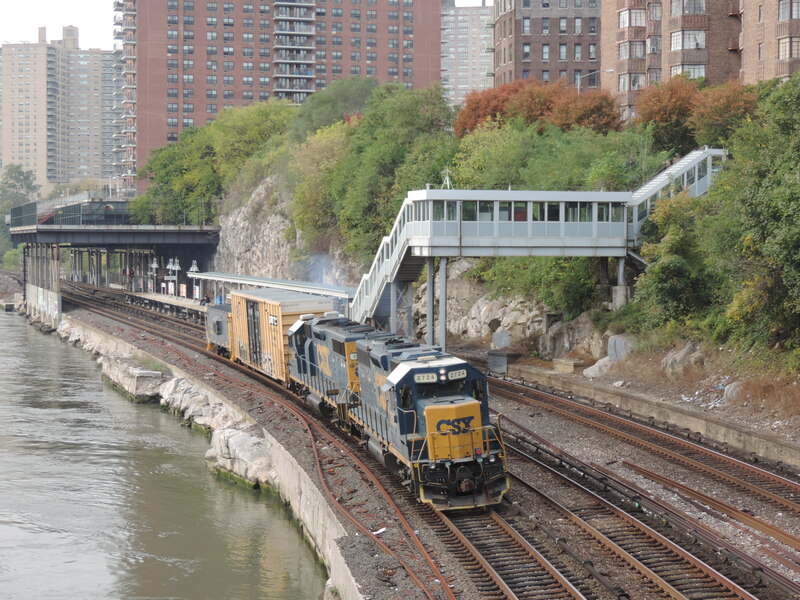 A freight train operated by private carrier CSX moves southbound out of the Marble Hill station on the Hudson River line in the northwest Bronx. The tracks in this part of the line parallel the Harlem River, and move alongside densely populated residential neighborhoods and important public buildings and infrastructure, including JFK High School, the Allen Pavilion of Columbia-Presbyterian Hospital, the Broadway Bridge, and several shopping malls. BCJN’s campaign to stop the idling of diesel trains on the Hudson River line in the Bronx and to alert Bronx communities to the hazards of propane transport on the line has had limited success thus far. Though we were able to persuade the freight carrier CSX to cease idling freight trains at the Marble Hill Metro North station, where a crowded neighborhood struggling with pollution and other economic and quality-of-life issues is perched directly over the tracks, CSX, without consultation and against our expressed wishes, decided to idle its trains in the Highbridge area instead. For details about the campaign, please read the following BCJN op ed, published by The Riverdale Press on March 12, 2015: The trains in our midst. The Riverdale Press published a follow-up news piece about the train issues on 8/27/15, quoting BCJN and BCJN ally and South Bronx Unite leader Mychal Johnson: Idling Trains Move South But Vexation Remains.